This laser confocal image shows a GFP transgenic mouse retina under the control of the GFAP promoter stained with anti-Collagen IV (blue), anti-GFAP (red) and anti-GFP (green). These labels not only show the spatial relationship of individual astrocytes to one another, but also the vasculature. 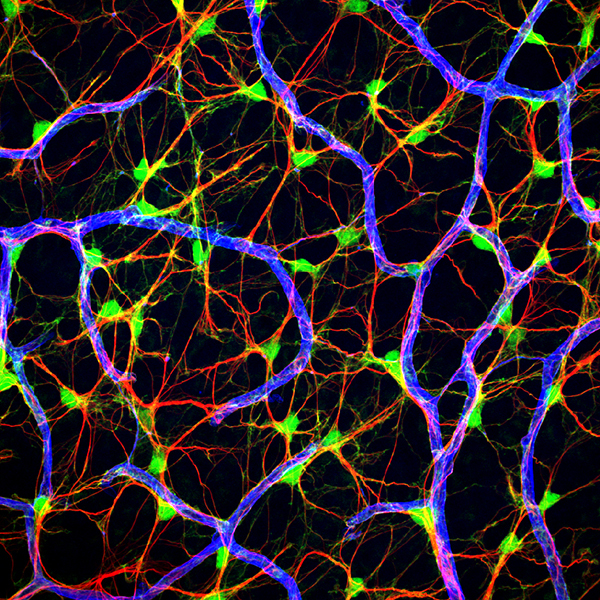 Image provided by Gabriel Luna out of the Steve Fisher and Geoff Lewis’s retinal cell biology group at UC Santa Barbara Neuroscience Research Institute.